It has been said that during the Regency a man's time was his own, while a woman was expected to engage in only a few genteel pastimes. For instance, only men were free to vote, hold office, box, fence, hunt, drive alone, shoot, attend a club, drink, play cricket, dine out freely with other men, game (gamble), race, and even womanize. There were some women who got away with having affairs; but they were already married. If a single woman, on the other hand, attracted the merest scent of sexual immorality before marriage, she was "ruined," while with men it didn't really matter how they behaved. The emphasis for them was to take care of the family estate by siring an heir. Whether or not they maintained sexual integrity, or honour, or moral fortitude was more of a personal choice; Fortunately, many men had well-developed moral codes, and Jane Austen's books, for instance, often highlight the negative social consequences caused by the actions of those who lacked them. Other avenues open to men but not women included entering the army or navy, or going into the church. Both (the military and the Church) were popular vocations for second or third sons throughout the regency. Finally, if a man had independent means such as rich parents or a large fortune, he could also choose to simply be "a man about town." The best dressed and best looking men about town were usually the beaux and dandies. (Do not mistake dandies with fops--even the Prince Regent had years of dandified glory until he grew too large to cut a fine figure). The dandy is the style of male figure most regency romances rely upon to some extent for their heroes. None of Austen's heroes are mere idlers, even Mr. Darcy, and all are endowed with a deep sense of justice and honour. My own Mr. Mornay (from, Before the Season Ends) is independently wealthy due to his tenanted estate and other properties which he runs with meticulous care, and he has a great sense of fair ness and morality that stands him in good stead as a proper hero. Finally, only men were allowed to be University educated. Women often were schooled at home, or were self-taught, and there was always the occasional Young Lady's Academy, but nothing more. Some, (like Jane Austen) became novelists, but most of these women were quick to let their public know they were doing it to support their children. Others, like Mary Anne Evans later in the century, used a male nom de plume. (George Eliot), as it was thought inappropriate for women to write novels. 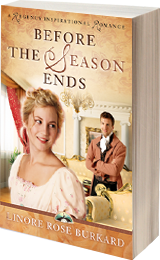 A Christian young woman makes her way through the treacherous waters of a Regency Season in London; while her worldly, wealthy aunt tries to marry her off for money. 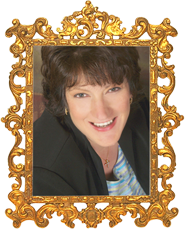 Linore Rose Burkard is best known for historical regency novels with Harvest House Publishers, including Before the Season Ends, the award-winning The House in Grosvenor Square, and, The Country House Courtship. As a writer noted for meticulous research as well as bringing people to life on the page, Linore's books delight fans of historical romance with "Heyeresque" humor and "Austen-like" manners. Oh, the lives of men back then! Before The Season sounds like a wonderful book. Thank you for the very enlightening post. I thoroughly enjoyed it. My pleasure, Melanie! Glad you could stop by and thanks for letting me know you enjoyed the article. I don't send newsletters out often, but if I do, they have more such articles about the Regency. If you're interested, you can sign up for the free newsletter at my website: http://www.LinoreBurkard.com Thanks! I really loved Before the Season Ends. Do you plan to write other Regencies? I do hope to publish more regencies--so stay tuned! All I can say is, "No fair!" I'm glad I didn't live in the time period. Thanks for the interesting info, Linore. Times sure have changed. Thank you for sharing this interesting post. Your Mr. Mornay sounds like a wonderful hero! (Check your local library for a copy of Before the Season Ends so you can find out for yourself if you don't care to purchase the book! And if they don't carry a copy--did you know this? You can ask them to order one.) Thanks for stopping by! Those poor single ladies in the Regency period! They really had to behave. Married women could behave badly and still survive the cultural norms. Glad I live in the 21st century but even happier I married in the 20th century where marriage was still considered the cultural norm!